Would you believe me if I told you that every time I use lemons, I’m more than a little reluctant to throw away the skins? The need to somehow extract the maximum from these golden globes screams borderline OCD, even to me. To tell you the truth, I literally feel like I’m throwing so much of the essence of the lemon into the bin. Maybe because they seem to still contain so much flavour even when they are spent of juice. Every time I squeeze a lemon, the invisible oils explode on my hands like aroma bombs, filling my head with images of sunny days, white linens, green salads, the reddest tomatoes, the bluest skies and my favourite… lemon tarts. I remember, sneaking in golden lemon tarts into my boarding school dorm with my friends, scouting for safe corners, and the silent, respectful consumption of our contraband. The fact that we were discovered more often than not, made the ritual even more hallowed. So yes, I love lemon curd. It’s a cheeky kiss of saccharine rather than a sweet bear hug and that’s what’s so perfect about it. 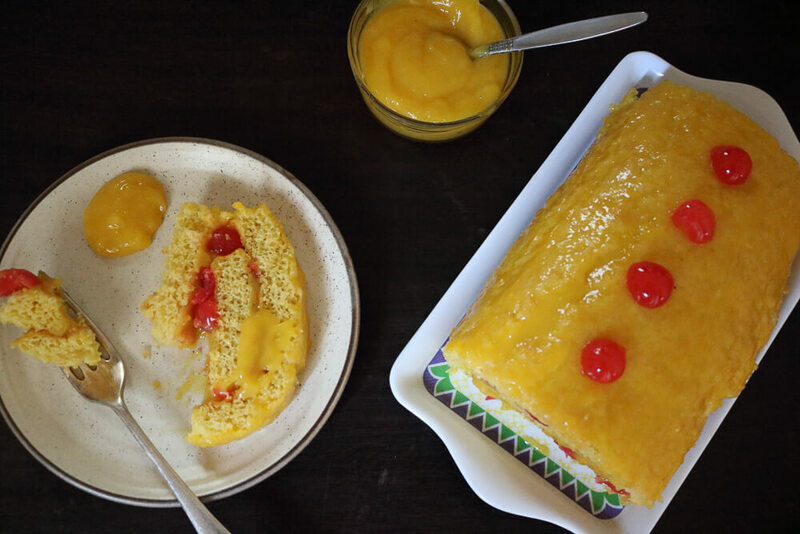 Lemon curd can be eaten with literally anything. Smeared on a plain Jane cracker, delicately piped into a buttery pie, slopped on simple vanilla ice cream or straight up spoon-in-jar style. This time I tried filling a Swiss roll with it to create a feathery-light dessert to calm my curd craving without the calorie overload. I also threw in glossy-red Maraschinos. Yes I know the yellow and red combo is very 70s but I’m always drawn to retro kitsch – it does have a certain appeal. 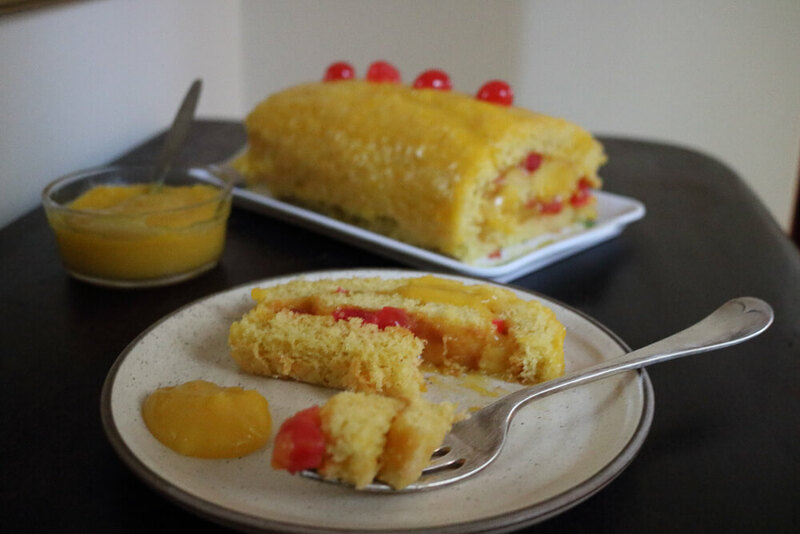 But colour palette aside, it was spongy and airy with the tongue-curling sweet tang of lemon curd, and I licked the spoon and every little lemony dot and crumb off my plate. 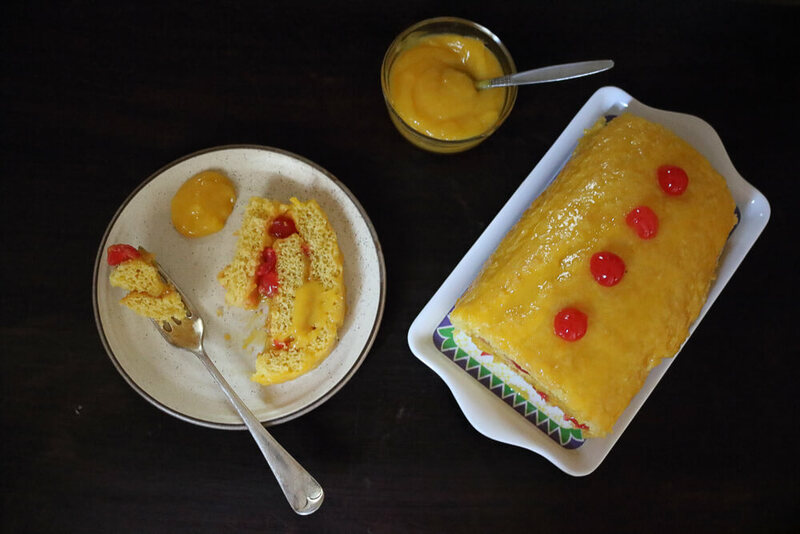 The lemon curd takes all of 10 minutes to make and the sponge just about 15 minutes more. The ingredients are standard store cupboard stash except the cherries maybe, and those can be easily substituted for other fresh or dried fruit or even omitted altogether if you so wish. I could’ve rolled the roll with a little more finesse, but it was nothing a generous smothering of lemon curd wouldn’t dress up. In a saucepan, combine the egg, yolks, sugar, lemon zest and juice. Gently bring to a simmer on medium heat stirring continuously to ensure that all ingredients mix well. Keep stirring and cook for about 5 minutes till the mixture starts to thicken to a custard-like consistency. Stir in the butter and cook for a minute more or less till thickened to a curd. Remove from the heat immediately and strain through a medium sieve into a clean bowl. Cover with cling film pressing down on the surface of the curd. This will eliminate all the air and ensure that no skin forms on the surface. Set aside. Preheat the oven to 180 degrees C and grease and line a 25 cm x 30 cm Swiss roll pan. Beat the eggs in a bowl till pale and creamy. Add the sugar in batches, beating alternately to dissolve the sugar. Fold in the flour and the hot water. Pour the batter into the prepared pan and bake for 8-10 minutes. Turn out the warm roll immediately on a tea towel or parchment. Using a spatula or palette knife, slather generously with lemon curd (reserving about a third). scatter the cherries evenly all over. Using the short side of the tea towel or parchment, gently but firmly roll the sponge. Transfer carefully on to the serving platter and smother evenly with the remaining lemon curd and decorate with a few cherries. Chill for at least an hour before slicing the roll. The eggs make the roll airy and light. So you could try by substituting self raising flour for plain flour and add 1/2 tsp each of baking powder and soda bicarb to the flour. Also use 100g plain yogurt for moisture. Make sure not to overmix the batter. For the filling, instead of lemon curd, you could make a lemon cream by whipping double cream, lemon zest and juice together. Hope it works!